New travel guidebook to New York State highlights places to visit off the beaten trail. Getzville, NY July 24, 2017. New York State - when most people hear that they envision New York City, or perhaps Niagara Falls and Buffalo on the western end of the state. However, there is so much more to New York State. There are many interesting places located on the backroads and byways of the state, often just a short distance from major cities. My upcoming book, Backroads and Byways of Upstate New York, which will be available in stores starting September 5, 2017, covers something from every region of upstate New York, from mountains, lakes, beaches, and everything in between. It is by no means a comprehensive guide of all there is to see and do in this vast area of the state, which, for the purposes of this book, is defined as everything in the state except the New York City area and Long Island. Information about those two areas could fill an entire book by themselves! The nine regions that make up the upstate area are: Adirondacks, Catskills, Chautauqua-Allegany, Greater Niagara, 1000 Islands, Capital-Saratoga, Central, Finger Lakes, and Hudson Valley. Writing about everything to see and do in upstate New York would be an impossible task, and even if one could accomplish that, the reader would be overwhelmed with the sheer volume of information. 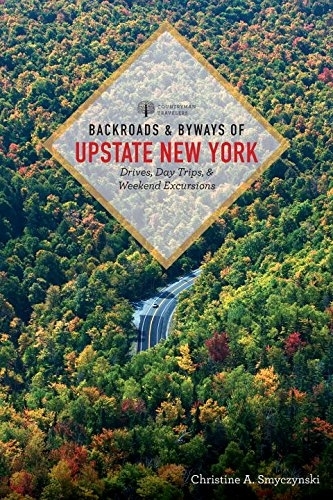 This book offers a sampling of some of the intriguing places to visit in upstate New York State, a number of them off the beaten trail, although others are close to the larger towns and cities. Well-known destinations are mentioned, as well as places you may have never heard of before. This book includes areas along the Hudson River, Lakes Erie and Ontario, the St. Lawrence River and the Erie Canal, as well as the scenic regions of the Adirondack and Catskill Mountains. When I started brainstorming places to include in this book, I had well over 50 ideas for chapters in mind. However, I quickly realized a book with that much information would be as thick as a phone book! Plus, I would never be able to visit all those places and get the book done on a timely basis. So I whittled it down to 20 drives and destinations, perfect for daytrips, weekend getaways, or even a week's vacation if you're so inclined. I've tried to include something for everyone: history buffs, shoppers, boaters, wine and beer aficionados, outdoor enthusiasts, families with kids, car and motorcycle fans, and everyone who wants to learn more about New York State. Some of these drives will take you partly on the highway, while others will take you into the middle of nowhere. A number of the routes I've included have definite themes, such as a wine trail, while others string together a variety of attractions and sights along the way. Some are established scenic byways while others are routes I personally thought would be interesting to travel. At the beginning of each chapter you get the basics of each drive; where to begin your trip, estimated time and mileage, as well as an overview of what to see and do on each drive. I'll even offer suggestions of side trips to take off the main route. The book will be available in bookstores, museums, gift shops, and other retail establishments across New York State, as well as through major book retailers, including Barnes & Noble and Amazon. If you are a retailer wishing to carry the book in your store, please contact the publisher W.W. Norton 800-233-4830.